* in a move designed to make it easier for a Thor series to catch some readers when the movie come out, if that's an end result, Marvel announced that what was a bunch of books of relatively equal standing will now have a Mighty Thor pretty-much flagship: Matt Fraction writing, Olivier Coipel drawing. With readership being what it is, I kind of wish this was a strategy across the lines, both to allow for easy recommendations from shop owners and partly to facilitate small-account comics sales in all the places that lack them. Pipe dream, though, and probably not even a good idea. 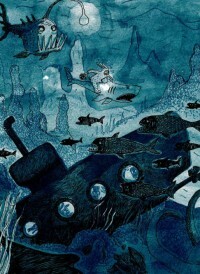 * Brecht Evens' Night Animals previewed. Whoa, pretty. * not comics: I'm not a gamer, but I enjoyed this chart of role-playing game choices. I like how it suggests incremental differences between the various games. I always thought that hobby did itself a slight disservice by focusing so much on design and very little on play in terms of how its coverage media is aligned. * not comics: Top Shelf signs with ICM. * so is this the best photo in comics history or merely one of the top five? I stop and stare at it every time I see it. * the cartoonist Piers Baker talks about syndicating a comic strip after that initial rush of interest wears off. * there's more interest than usual in the serial comic book Superman #707, as it's the first issue after the poorly-received "Grounded" storyline and the highly-publicized move by the writer J. Michael Straczynski from the title's full writing and scripting duties. Timothy Callahan reviews here. Chris Sims digs into it here. Graeme McMillan chimes in here. * not comics: they wanted to do a bunch of musicals in the 1970s, too. * the writer and cartoonist Matt Seneca writes at length about genre and character. * it looks like Dave Sim and Steve Bissette have ended their epic conversation, if like me you've been waiting to dive in. Sim and Bissette are legendary talkers -- Sim's even a top 5 faxer -- so I'm greatly looking forward to taking the whole thing in. * the writer Sean T. Collins presents the first part of his Destructor story with (I believe) Matt Wiegle Prison Break. I can't remember if this is brand new or if this is a representation of the best Destructor story, but either way it has my attention. * not comics: this way of sending someone a check is totally adorable, although it should spur in everyone looking at it a way of sending a check that is much less appealing. * not comics: PictureBox is publishing an edition of Charles Willeford's Cockfighter. I really liked their last Willeford effort. * not comics: congratulations to the fine writer about comics, Matthew Brady, on the addition to his family. * finally, I'm confused by this article on the sales success of European comics, if only that international best-seller Persepolis is mentioned only as a cousin to Epileptic instead of a already-passed bookstore titan.